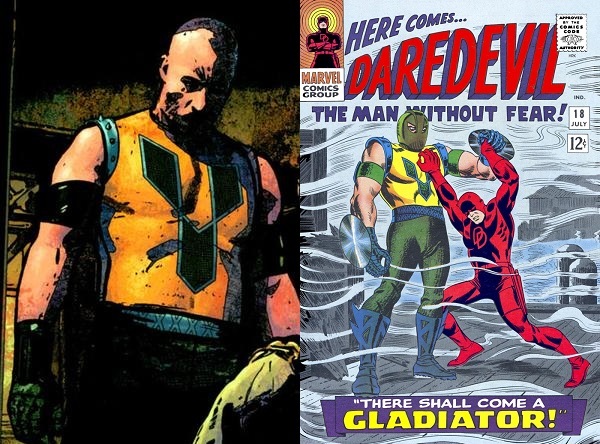 Created by: Stan Lee and John Romita Sr.
Daredevil’s early days didn’t really launch the success of any villains with much longevity, beyond Stilt-Man, mostly a joke in comics, and then Melvin Potter, the Gladiator. Melvin was a man jealous of the fame heroes received and wanted the power for himself. 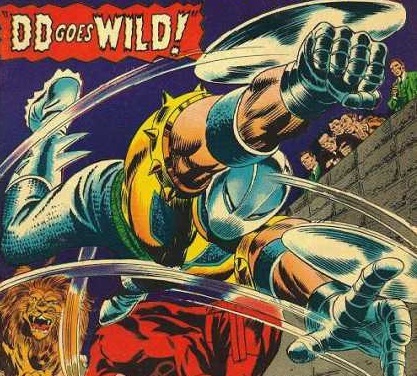 He started off as one of Daredevil’s most crazy, deadly villains who went on to try and kill the hero on numerous occasions. More recently he has had a change of heart to reform himself and become an ally to Daredevil along the way, with a few hitches here and there. He may not have gained the fame of other villains, but for Daredevil fans he has always been a great, slightly mentally unstable character. Melvin Potter began as a costume designer, creating replica party costumes of various heroes and villains. He grew to hate the heroes though, resenting all of the fame they received when he felt it was a large part due to their colorful costumes that he himself could make. Deciding that anyone could become a hero or villain with the right outfit, he creates his own to prove his point. He creates boots with a tungsten alloy blades, metal wrist shields that are powered by micro engines that can be used for attacking and propelling him forward for great leaps, along with his metal helmet to protect against blows which also contains a oxygen regenerator to breath in any situation. Being slightly egotistical already, he decides he will use his suit to take down all of the heroes that would stand in his way. Daredevil #18 begins Foggy Nelson entering Melvin’s shop. At this point, he was in love with Karen Page, who he knew fancied Daredevil. To try to work his way into her heart, he was trying to convince her that he was Daredevil, so wanted to buy a replica costume for himself. Melvin agrees to alter a costume to fit Foggy and tells him to come back at night so he can finish it. As Foggy leaves, Melvin’s hate for heroes comes out and he decides to create his costume and test it out on Foggy. Later at night when Foggy comes back for the costume, he enters the shop and finds Melvin in the back working on his Gladiator suit. Melvin gives Foggy the Daredevil costume but tells him that if he really wants to impress Karen, Melvin can hire someone for him to dress in a super villain costume. The actor would let Foggy get into costume and take a few punches before running away. Foggy agrees to the idea, unbeknownst to him that Melvin is planning on being there himself as the Gladiator to kill him. Matt knows Foggy has been trying to convince Karen that he is actually Daredevil, which Matt believes could be very dangerous for the three of them. He follows Foggy around and sees him trying on the replica costume. Knowing this can’t be good, he continues to follow him back to the office where Foggy tells Karen they must go out to meet a client, where Foggy told Melvin he’d be. The two get into a cab while Matt follows from the rooftops above. The location is an old dock and when they arrive, Gladiator challenges Foggy to a fight. Still not realizing the danger he is in, Foggy tells Karen to stay put while he goes behind some crates so he can switch to the Daredevil costume. He changes and rushes at Gladiator, but trips into Gladiators punch, knocking him unconscious. Karen sees this and tries to go find the police for help. Using his enhanced senses, Matt realizes that Gladiator actually means to do Foggy harm so jumps in to fight him. The two battle and are knocked into the water. Gladiator believes he has the upper hand because of the breathing apparatus in his mask, so tries to drown his opponent. Luckily for Matt, he had recently fought Namor and had worked on his breathing techniques. He lets Gladiator believe he has drowned. Melvin gets up onto the docks thinking himself victorious, only to have Matt spring from the water and hit him in the back. 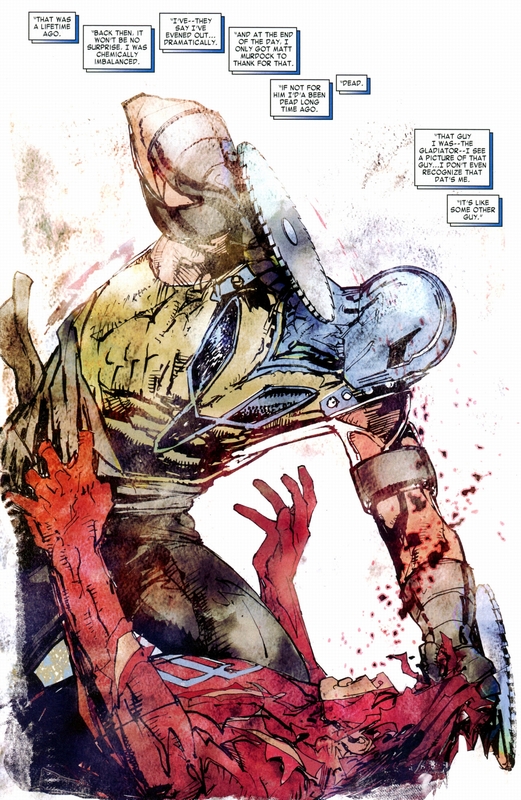 Using his heightened senses again, Matt notices an open spot right underneath Gladiator’s helmet, and delivers a quick below, rendering Melvin unconscious. For his first day as a super villain, Melvin didn’t have the best day or the worst either. With his suit he was able to go take on Daredevil and come close to winning. His costume he chose is not one that was the best looking design back when he was introduced and definitly not now, but it was deadly. Melvin thought it was the costume that made the hero or villain, but as a character he has proven that wrong. 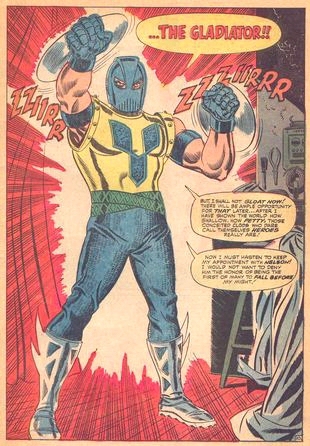 Even without the most appealing costume design, he became a deep, interesting character in the Marvel Universe due to his rich characterization over the years which kept writers bringing him back. Wonderful submit, very informative. I ponder why the opposite specialists of this sector do not understand this. You should continue your writing. I’m sure, you have a great readers’ base already!|What’s Happening i’m new to this, I stumbled upon this I’ve discovered It positively helpful and it has aided me out loads. I hope to contribute & aid other users like its aided me. Great job.